The temperatures in Death Valley historically average above 90°F from April to October, thereby necessitating special attention to the Heat and Illness Prevention Plan. Over the summer of 2017, the temperature reached a whopping 127°F in mid-August. July 2017 is now the hottest month on record – ever! The average temperature was 107.4°F. This breaks the previous record of 107.2°F set in 1917. Using supplemental PPE items such as neck shades, hardhat brim extenders, long-sleeve dry fit class 2 shirts in lieu of safety vests, sunscreen, unlimited amounts of water and ice, and air conditioned cool down rooms. We are committed to the health and safety of our employees and partners on all projects. 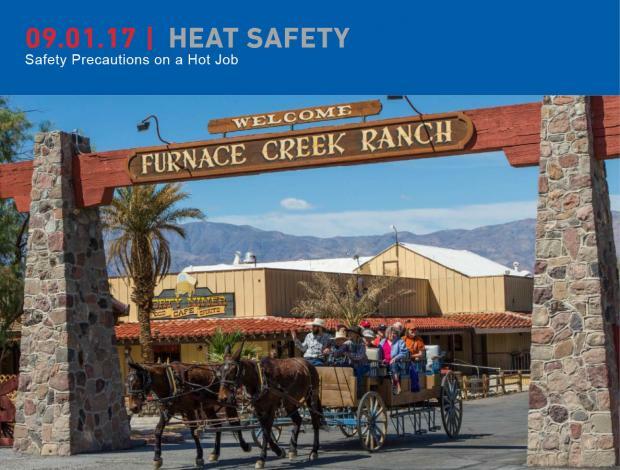 When faced with extreme environmental conditions such as the ones in Furnace Creek in Death Valley, it is up to our foremen, managers, and supervisors to educate the workers and take action to enact our Heat and Illness Prevention Program. Our HIPP leads the way for combating extreme environments such as the one in Furnace Creek, where we will once again face the heat in 2018.